Everyone knows and talks about the importance of warmup before starting any exercise. 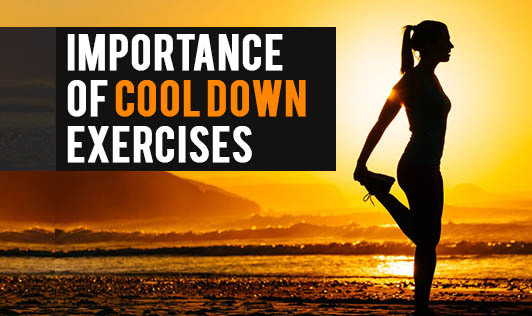 But did you know that cool-down exercises are equally important? Cool down exercises are necessary to bring the body to the pre-workout level and to promote recovery. The body gets stressed after each workout session, including the muscles, tendons, and ligaments which lead to a build-up of various waste products. A good cool down routine will help the body repair itself faster. During workout, the heart pumps out a large amount of blood to the working muscles to carry oxygen and nutrients. When the workout stops, the force that pushes blood to the heart will disappear. This results in waste products getting retained in the muscles causing pain and swelling. This is called "blood pooling". The cool down process helps to keep the blood circulating, and thus prevents blood pooling. It also helps to remove some of the waste products from the muscles post-workout. The cool down process should occur immediately after the training session and should last for 5 to 10 minutes. Cool down exercises can be similar to warmup exercises but should involve lower intensity body movements. Stretching after exercise ensures maximum flexibility, relaxation of muscles, and helps return muscles to their resting length. Helps heart rate and respiration slow down gradually. Helps to avoid dizziness and fainting that occurs when exercise is stopped suddenly. Helps in removal of waste products from the muscles. Relaxes and prepares the muscles for the next workout. Helps to end the workout on a good note. Slow Down: Gradually reduce the intensity of the exercise and allow your heart rate to slow down. Continue Moving: Give yourself some time to move around after high intensity exercise. Do not stop abruptly. Cool Off: Keep moving till you stop sweating and your skin becomes cool. Stretch: Once you've cooled down, stretch the important muscles like quads, hamstring, and triceps to bring it to its resting length and to prepare them for the next workout. Make sure you hold each stretch for at least 15 to 30 seconds. So, make sure you cool down after your workout to avoid sore muscles!